Long weekends are so welcome, aren’t they? Take a look at each of these 20 resorts that you can visit with the whole family in tow. Aren’t family holiday getaways the best thing for us when we’re tired of the routine and just want a break? If you don’t really like to travel too far from home, these resorts are what you need. 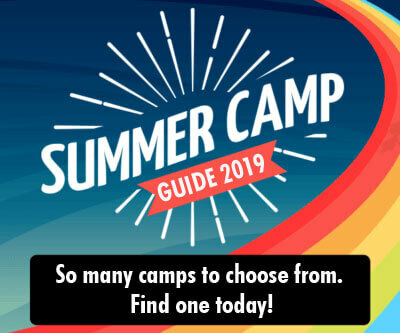 Pack those games for the kids, get your checklists out and book your stay today! If camping amidst rocky landscapes and trekking up for some adrenaline rush and cultural history sounds like an ideal weekend for your family, Camp Linger is the place to go. Have your kids experience putting up a tent or acquaint them with the mythical lore behind the Namada Chilume. The highlight of the place is the tent stay. Ask the host to show how to set one up and they would gladly oblige. Enjoy long treks to the nearby hill, visit the Devanarayanadurga temple, Namada Chilume-a-natural spring, a deer park closed by. Carry binoculars as the place is great for bird watching. While the place is stocked with board games and books, you are free to carry along your favourite ones. Consider taking your kids’ cycles as there is plenty of open space around. If lucky, you might even get to spot a bear. Enjoy the campfire in the evenings. Gaze at the stars at night and share stories. Maintain silence and you can hear the peacocks calling at a distance. Tents priced between Rs.1500/- to Rs.2000/-. They are comfortable but pretty basic with beddings and blankets. No wi-fi or television means you get to enjoy the holiday without distractions. Note, the power supply can be intermittent, so do carry along a power back up for your phones if you wish. When you have an ambience that exudes peace and comfort, you have the perfect balance for a getaway. The kids will be thrilled to ride on the bullock carts or play with the farm animals. The environment is safe too. Kids favourite and all time entertainment – The swimming pool, is elevated that offers a nice panoramic view of the entire farm. It’s barely 5 feet deep and apt for some fun water games. They also have a baby pool perfect for the toddlers. Military style obstacle course designed just for kids. This can surely keep them occupied for a while. Children’s play area or play zone is well equipped with slides, large swings etc. The play area is well located and viewable from everywhere. Feel free to relax while the kids enjoy the park. For the cricket fans, cricket nets are available; enjoy a good game of cricket in the afternoon. Activities like bullock cart ride or milking the cow can be arranged. Outdoor games like badminton and basketball are also available. 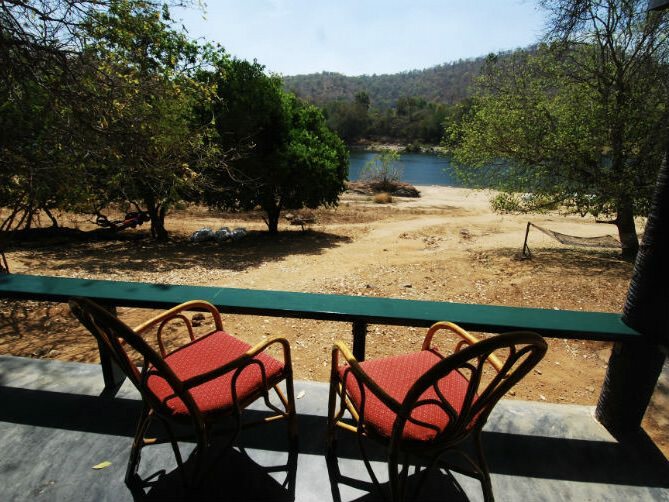 Morritt Farms is an eco-friendly farm-stay located at the Kolar Gold Fields, overlooking a farm lake. They have two styles of accommodations – The Cottage and The Guest house. All rooms are equipped with the basic amenities. Kids below 9 years are offered a complimentary stay. They also provide Day trip packages, and here are the details . Overnight package for two is Rs.3900/-per night per head. With activities like a coracle ride, zip line and Burma bridges jostling for attention, can anyone feel bored here? The resort itself in a scenic location and one can opt to stay in a tent too. Rope activities such as Burma loop, rope walking, parallel walk, adventure sports, watch tower, trekking and zipline. Animals you can see will include crocodile, fox, squirrels, wild boars, deer and tons of monkeys. Beware of the monkeys, though! They have 4 different types of accommodation – The bamboo hut, cottages, log huts and the tented cottages. The log hut would be the most comfortable for a family. It’s well located overlooking the river and closest to the dining hall as well as air-conditioned. The Cottages are comfortable as well though it’s a bit of a walk to the dining hall which could be a bit tough during the night; they do have a jeep in case you don’t wish to walk. Staff is extremely friendly and prompt. 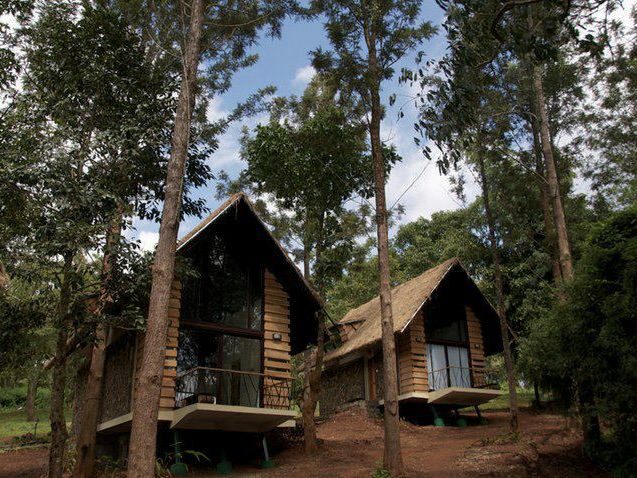 The tariff for the Log huts is approx Rs.6,127/- per head per night. You can view the complete tariff details here. Also please note the rates are subject to change so please check with the resort while you book. Children between the ages of 5 to 12 years are offered a 50% discount. Please note there is no television in the rooms and no mobile activity is available at the resort. There are tons of monkeys around so please do remember to lock your doors at all time, also avoid having the kids walk around with any food in their hands. Monkeys are very mischievous. A pretty little B&B in the midst of Nature run by Georgia & Len, will surely soothe the city-bred soul. 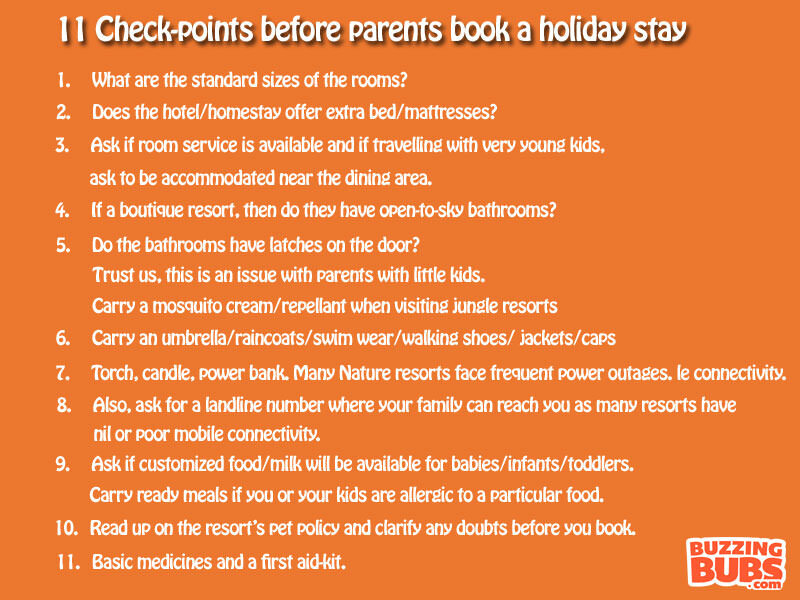 Note, while it is a kid-friendly place it’s also a pet-friendly resort, though they do have a pet policy, so do check the details while your booking. They do prefer a written confirmation of your booking. Literally a home away from home. Their farm animals will absolutely delight the kids. They house about 8 farm dogs, a cow, turkey, rabbits and geese. There’s ample green space for kids to run about. You can even have a game of cricket, badminton or volleyball for which provide you with a net. You can consider carrying your cycles since it’s lovely to ride around the lush property. You can also go fishing to a nearby pond, they organise a bonfire every night by 7:30 pm. It’s located close to the Sivanasamudram falls, so it’s an added attraction during the monsoon when the falls are their glorious best. Beware of the leeches around the waterfall area. Although the resort welcomes pets, it’s not particularly a pet-friendly resort. For instance, you may have to carry separate pet food. Do read up on their pet policy. Their home cooked meals are mouth-watering. The cottages are basic, clean and comfortable with bathrooms open to the sky. It’s a homestay, so there won’t be any room service and guests may have to adhere to meal timings. Indulge every bit of your senses in this luxurious setting nestled between Mysore Palace and Brindavan gardens. Take long walks by the man-made lake or take a dip in the large pool, cycle away or play indoor games. Kids are bound to have a great time at the play area and the beach-like kids’ pool. An artificial lake with a beautifully landscaped lawn around it. The lawn is great for kids to play, so do carry a ball or a frisbee. The pool is huge and children would love playing in the clean waters. Remember to carry your swimwear. 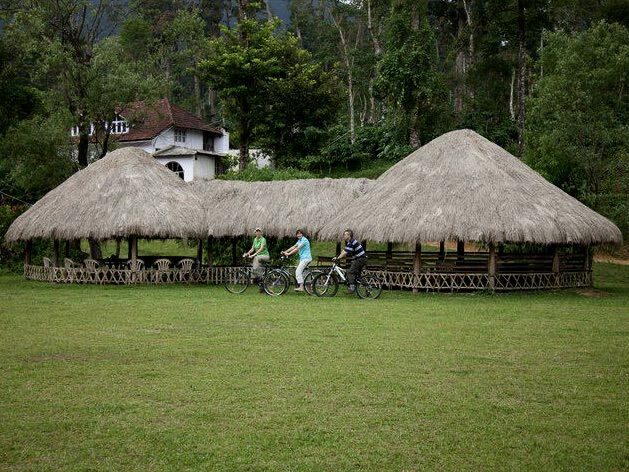 They provide cycles at a nominal rate, so the family can enjoy cycling around the property. Note: they do not have very small cycles/ tricycles, so if you have kids in that age group, you might want to consider getting their own cycles along. The play area will keep the toddlers engaged. There isn’t much for older kids to do in the resort but that’s hardly a negative as the Chamundi Hills, Bandipur Tiger Reserve or the Mysore Palace is very close by. The rooms are luxurious and spacious, accommodate up to 4 people and are priced between Rs.6000/- to Rs.8000/- per night. Opt for the ones that face the lake or the pool to enjoy a beautiful view. Located in the foothills of the beautiful Biligirirangan Hills, this eco-friendly retreat is a pleasure to stay in. They support tribal development and eco-tourism and you can see their efforts reflected in the form of the activities they offer, also a successful business model. A bonfire in the evening with a special tribal dance that lets you get a sneak peek into their culture. Kids can also enjoy a zip line activity. There are also indoor games to keep them occupied. There are short guided treks to the nearby tribal hamlet and Nature walks arranged that is a pleasure as you get to spot some rare birds and enjoy the pure air. Take the K. Gudi drive along with the naturalist to the BR forest sanctuary where the dreaded Veerappan once roamed about freely. Priced between Rs.3000/- to Rs.4000/- per night, you can opt to stay in one of the spacious cottages or tree-house or even a tent house. The cottage rooms have a bed at the attic for kids, so that’s a huge attraction. Pretty hammocks dot the area between cottages. They serve a buffet but are also willing to customize any meal requests. The Ayurvedic spa here is said to be rejuvenating and is highly recommended. This is a beautiful nature resort in Hassan surrounded by history and culture. The rustic look meets modern amenities and entertainment options like the pool, indoor/outdoor games, cycling, and even bullock cart rides and musical shows. Enjoy within the resort or even make a short historical visit to the nearby Halebidu and Belur. The bullock cart ride to the nearby village is the highlight. There’s a swimming pool and facility for indoor games like TT and carrom. Kids can also cycle around the well-maintained property. They organize music and dance programs featuring local artists to give the guest a peek into the rich culture of Karnataka. The resort is located close to Halebidu and Belur. So one can visit the archaeological sites and temples to catch up on some history and glorious architecture. The ambience is royal and rustic at the same time. The cottages are all spacious and luxurious with all the modern amenities. They are priced between Rs.12000/- to Rs.17,000/- per night. They offer a live counter at their buffet spread where you get to taste traditional and local cuisines. The food is farm fresh, right out of their organic farm. 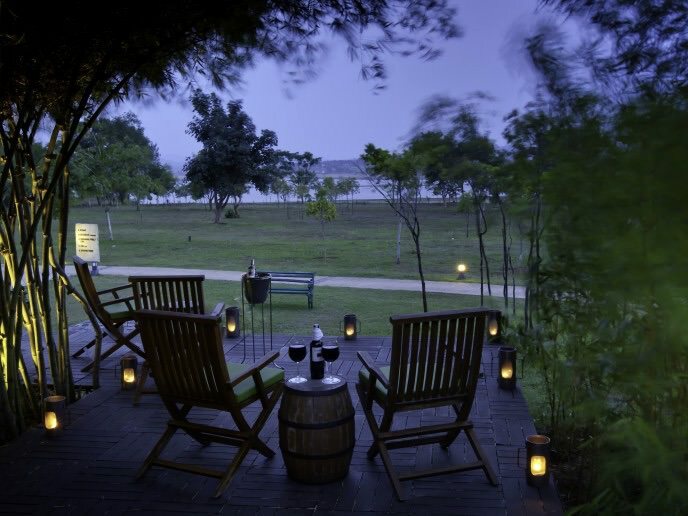 Located by the peaceful backwaters of the Kabini, this picturesque resort will awe you at every point. The wildlife safari and bird watching activities are like the cherry on the cake even as you make most of the other recreational facilities like the spa, kids play area, library, swimming pool, cycling, and jogging tracks. The swimming pool is clean and will delight the kids. There are hammocks under the mango trees, something even the adults would love spending their time in. The tiger safaris are an obvious attraction but one can also go bird watching early in the morning. Do not forget to carry a pair of comfortable shoes. The magic show and tribal dance are arranged on weekend nights and definitely add up to the excitement factor. Cycles are provided at a charge and there are amazing cycle tracks along the Kabini river, the details of which are put up on their website. One can take guided walks to the nearby village, a monastery, and a camp where elephants come for their feed. The cottages are clean and spacious and are priced between Rs. 9000/- to Rs.14000/- There are special packages too. Each cottage comes with a Jacuzzi. Kids below 8 years get a complimentary stay. Note: The last patch to reach the resort is bumpy as the roads are bad. 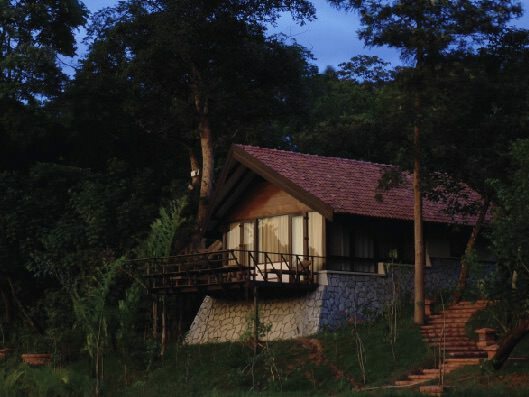 One of the best resorts in Bandipur, Tusker Trail provides luxury within a jungle. 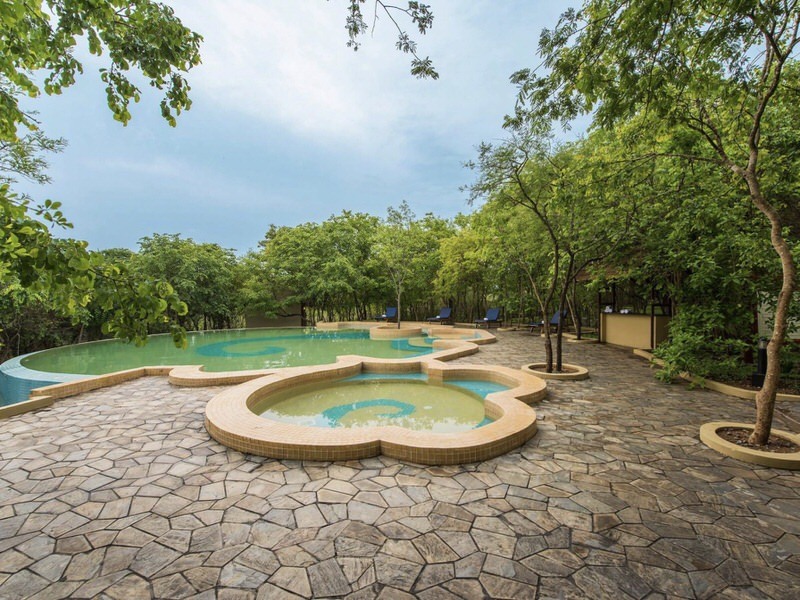 Choose to relax by the enchanting pool or go on a Tiger Safari, the options are plenty. Swimming pool is small but well maintained along with a baby pool that overlooks the jungle. Perfect time to dip in and relax at the pool. The restaurant serves good food, and are open to serve food with less spice for the kids. Feel free to call out to the chef. High chair available for the toddlers. They have a separate space allotted for a few indoor games like foosball, pool table and table tennis. The jungle safari can be arranged by the resort, if you’re lucky you may spot the big cats. 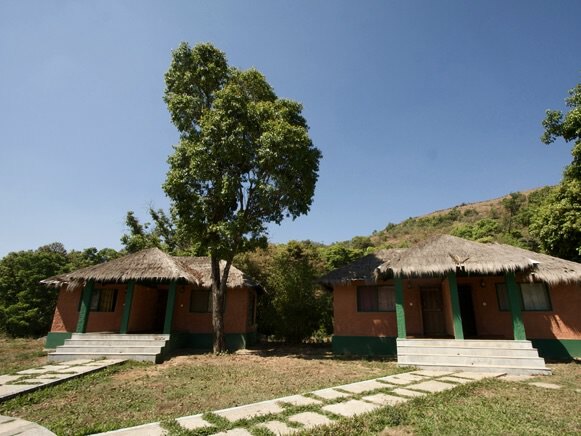 Beautiful rustic cottages located in the Tiger Reserve. They have two types of rooms, The Studio or The Suite, that one can choose from. Though the Suite would be ideal for a family. You can check the tariff of the rooms here. 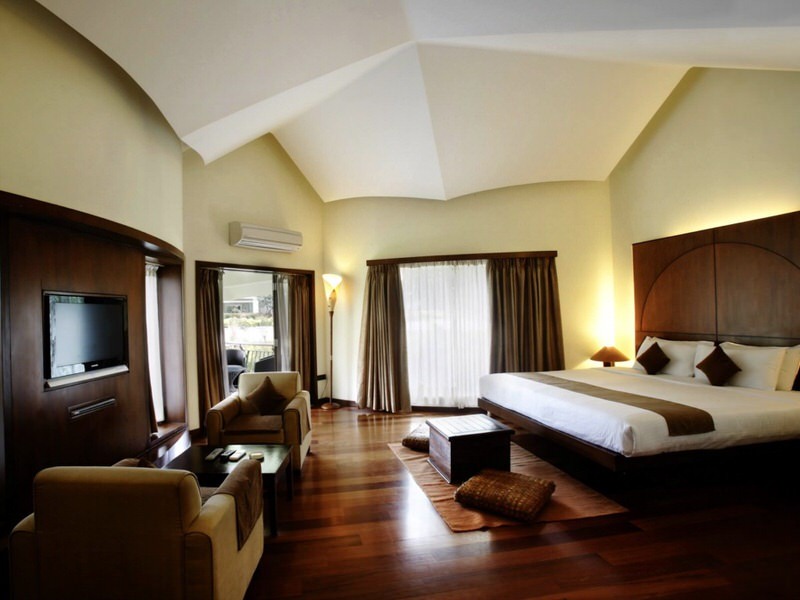 The Suite, is a large spacious room with the most comfortable and bouncy bed. The room has enough space even after an extra bed was added. 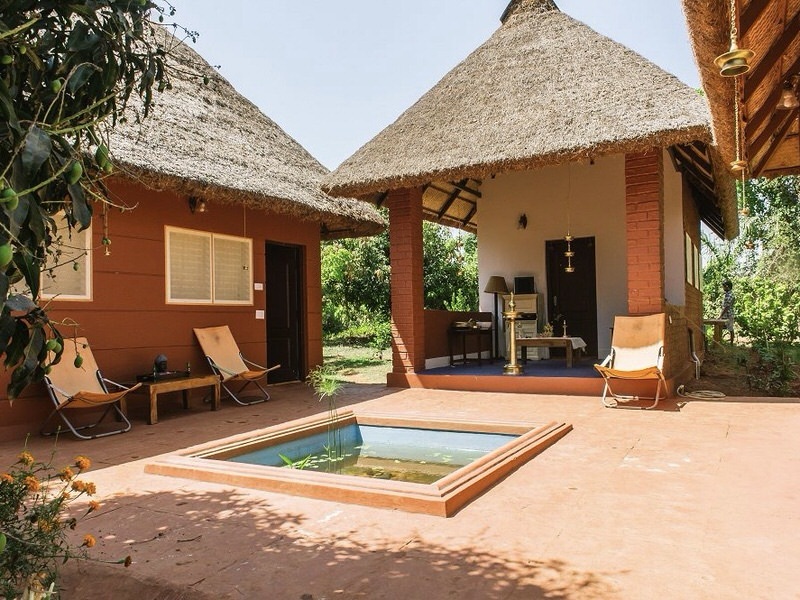 Each room has a lovely simple sit-out where you can just relax and enjoy the serenity of the jungle and maybe even spot a bit of wildlife like the spotted deers or even a mongoose at the property. The bathrooms are not large but spacious and well designed with an open shower, allowing a lot of daylight in. Please note: there are no televisions in the room as well as no mobile activity or internet. 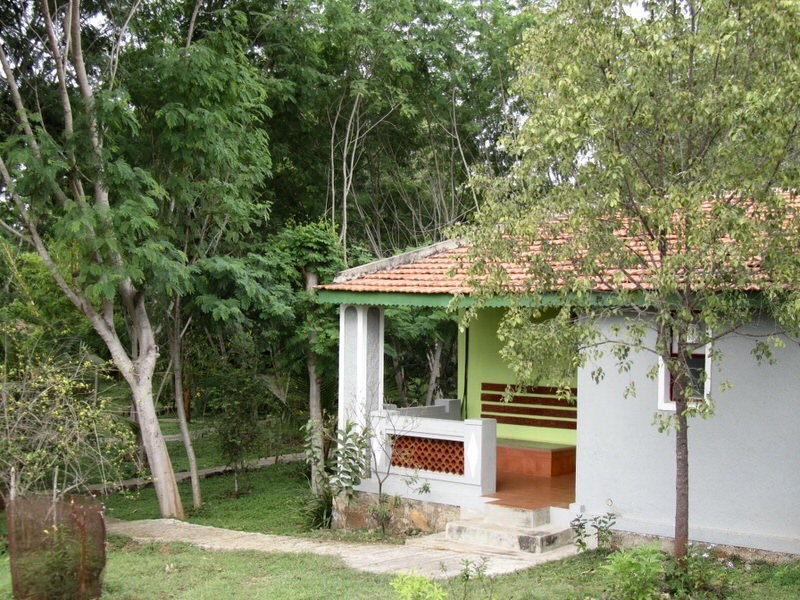 Tucked far away from the main road, this pretty resort has eco-frienfly cottages to charm you. The individual cottages and the main dining area is stocked with books, board games, and badminton rackets to keep the entire family engaged. Spend your time exploring the lush green plantation or simply sit by the verandah watching some rare birds. They conduct jeep races. So, if you’re game for some adventure on the hilly terrain, you might want to enquire more about it. They have bicycles that can be used to ride around the lush property. Note, these are adult cycles, so you might want to carry your kids’ cycles if they ride smaller ones. The dining area and each of the cottages come stocked with a mini-library and board games. 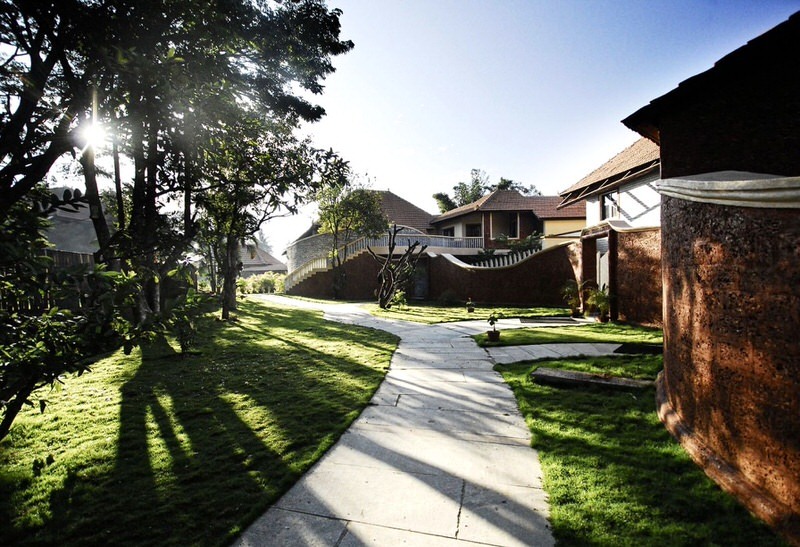 The hill-top cottage opens into a small and beautiful lawn where you can play badminton or kids can simply run about. A lot of rare species of birds are found around the property, so keep a watch. You can even hear the cries of peacocks at a distance. 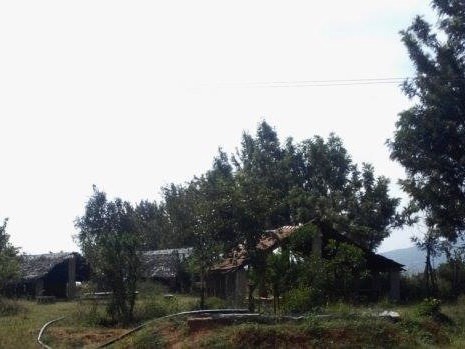 The property is tucked far away from the main road. They have a parking area from where you need to go by jeep to reach the cottages. The ride by jeep itself is a thrilling experience for us city dwellers. The cottages are very cozy and decorated with eco-friendly material. Some of the cottages like the hill-top one are located at a short distance from the main dining area. So, if you do not fancy walking for every meal, you can either ask to be accommodated in one of the rooms adjoining the dining area or ask your meals to be delivered to your room. It’s more of a homestay than a resort; do not expect meals to be served at odd hours. There’s a kitchenette attached to the cottages where you can heat milk for little kids/ make your tea or coffee. 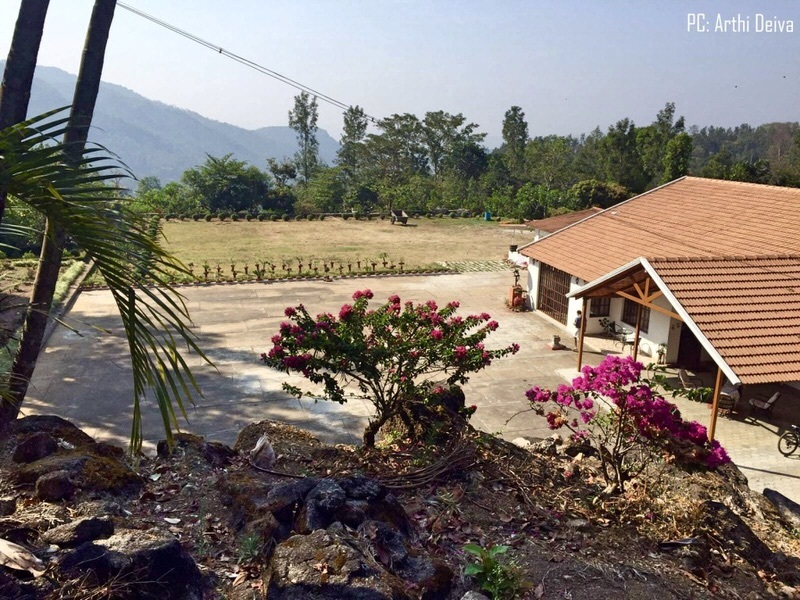 This large property located amidst breathtaking views of the valleys and peaks with ample entertainment option is sure to thrill you and the kids. 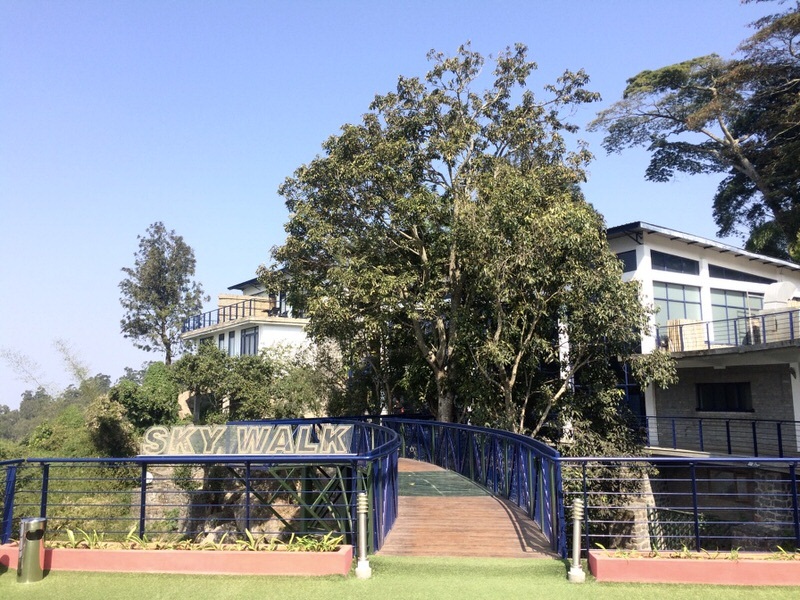 The highlight is the ‘sky bridge’ that overlooks the lush Shevaroy ranges is a visual treat. One tip, avoid leaving any food items or juice in your balcony and do keep your doors shut or you could be invaded by monkeys. A large play area and adventure sports ( the adventure sports are charged extra). They even have a separate zipline for kids. Kids will enjoy feeding the fish at the pond. Upon request/ during weekends the hotel management conducts games for kids and parents at their amphi-theatre area. The highlight is easily the “skywalk” that overlooks the valley. Early morning walks will offer a breathtaking view of the misty mountains. The rooms are spacious and can easily accommodate 2 adults and 2 kids.The rooms on the higher floors offer a beautiful view of the valley. Do carry light winter wear as the hills get chilly during the evenings and early morning. Experience the jungle and wildlife while soaking up the luxurious setting of this upscale resort situated on the banks of River Kabini. The staff is extremely helpful and you’re ensured of quality food. The safaris will delight you and the kids even if you’re not lucky enough to spot the big cats. You can choose between the Waterfront Villa or the Residence. Both beautifully designed and well equipped with all the amenities that are required with a view of the waterfront. At the Residence you can enjoy the large bedroom space, living room and your own private jacuzzi – a huge treat for the kids and adults alike. You can read about their package details here. Please note: No television is provided in the rooms. Please note: The wi-fi signal is a bit weak, which is also a good thing. The backwater of Harangi river puts you in a good mood the moment you step in this cool and breezy resort. With a wide array of activities like a boat ride in the lagoon to cycling to horse riding, the kids will be completely entertained even as you choose to unwind in the beautific surroundings. 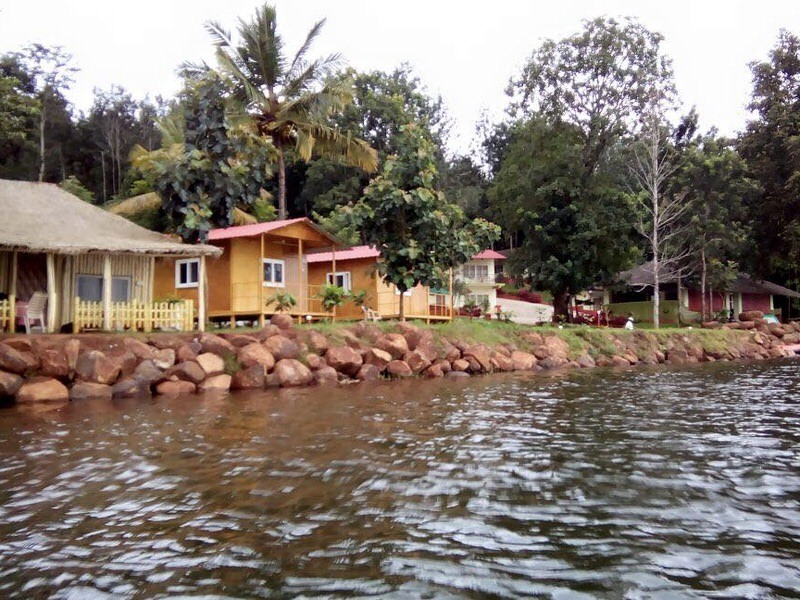 The backwater of the river Harini lends a serene look to the resort. You can ride a boat in the lagoon upon request. There are indoor games like snooker, carom, chess for kids. Kids can enjoy cycling on the banks of the lagoon. The hosts can arrange for horse riding or guided treks around the property. The outdoor area is huge with a play area. A trampoline is a special attraction for kids here. If your family is fond of playing cricket/badminton/volleyball, there’s ample space for it all. Make sure you carry all sports equipment. Priced between Rs.2000/- to Rs.6000/-, all the cottages are moderately sized and have private balconies that overlook the lagoon. The hosts are very accommodative and cater to customized meal requests. The last patch to reach the resort can be pretty rough. A rejuvenating stay without the distractions of the online world -that’s what you get here. Ideally located near the Malnad forests, you can stroll around the beautiful tea plantations or trek up a scenic route. spend quality time with kids or just do nothing! The off-roading experience available at an additional cost is truly enjoyable. The off-roading will take you to the top of the mountain where you can enjoy the panoramic view. Don’t forget to take your DSLR or camera along. The walk around the green expanses, towards the waterfall is rejuvenating. If kids are not up to the walk, you can stay back at the resort play a game of chess or have them explore the rope activity. Get some books or your own games along. Since it’s an eco-friendly resort, be prepared to get up and close with some creepy crawlies inside the rooms too. If you prefer camping, this resort provides several options. Do enquire beforehand. You need a 4X4 vehicle to cover the last 8-10 km stretch to the resort, else be prepared for a rough ride. Priced at Rs.2700/- per person per day, this resort is value for money. Children below 6 years go free. Meals are home cooked and can be customized for kids. The hosts are friendly and accommodate your requests. It’s an elephant camp, so you get a lot of them here! Watch the mighty but gentle beasts bathe in the river. 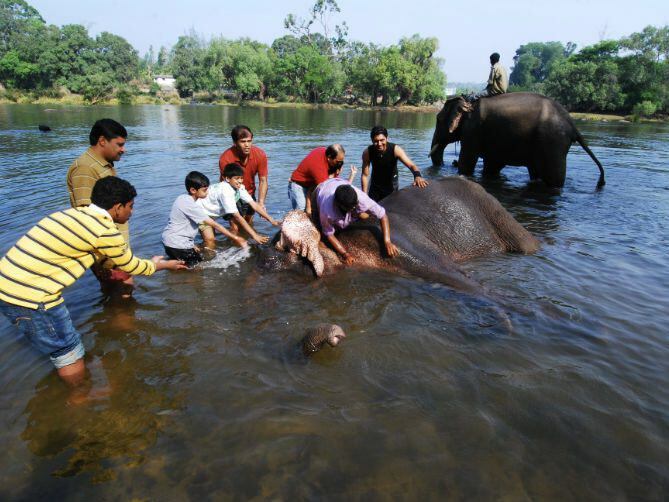 They follow a ritual of oil and water and as a parent you would like your kids to watch how even animals are treated with so much love and care. Elephants were used earlier to transport logs and the mahouts will explain how the elephants are trained to obey orders. Don’t miss the feeding session that closes by 11:00 am. An elephant ride is surely a major attraction for kids. Take a coracle ride in the backwater of Cauvery. When you see a crocodile, don’t forget to scream! There’s, of course, the jungle safari as an added attraction. The cottages are spacious and luxurious. The elephant activity is at an added cost. It’s an eco-friendly resort and camp, so be mindful about the plastics. The backwater of the Bhadra river is a sight to behold. With the Tiger reserve and wildlife sanctuary in close proximity, you’re assured of an exciting time. Kids would especially love the jungle and water safaris. Best time to visit would be from June to September after the monsoons are over the sanctuary is lush and green. March and May is nice as well though it could get a bit warm. Travel tip: There aren’t too many places to stop for a break though you do have a Cafe Coffee Day just before Arsikere, so do plan your break accordingly. 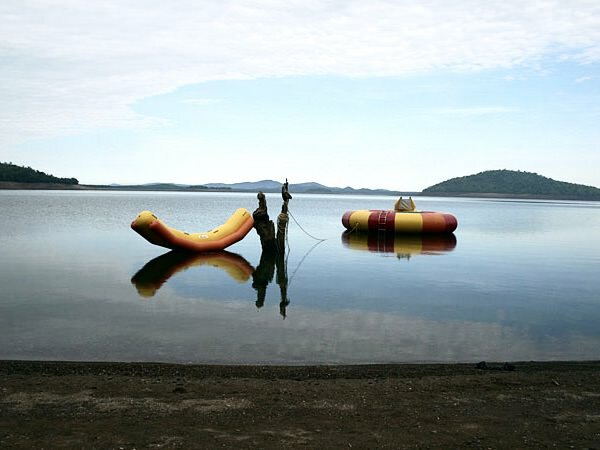 Enjoy your time with the soft water sports and don’t miss the water trampoline. Water sports are subject to the season. Do try out the boat safari and be sure to carry your binoculars as you may spot some magnificent birds like the river tern that migrate to the islands and live here from the months of January to June. Jungle Safari is a bit of a bumpy drive and a must do; even though you may not spot the big cats you do see peacocks, bison and spotted deers. But more than the animals, enjoy the beautiful jungle. Don’t forget to carry your most comfortable shoes. If you’re visiting during the summer do carry along your hats and sunscreen. If you’re in the mood to explore the areas around, your options are the Jog Falls, Kalatagiri Falls and the Bhadra Reservoir to name a few. They have 8 log huts and 15 cottages with balconies that overlook the backwater of the Bhadra Dam. Each room is equipped with an electric kettle with tea and coffee satchets. Please note room service is not available, though you could check with the staff if they would oblige. Please note no television is provided in the rooms. You’re in the midst of nature; enjoy it. 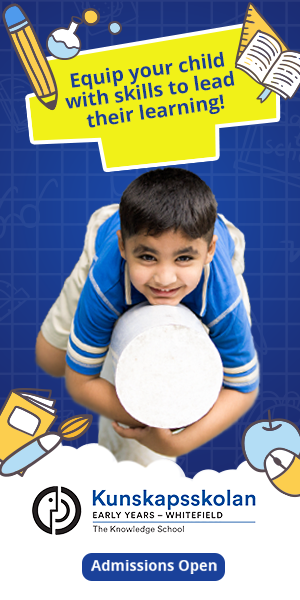 Tariff for kids between 5 to 12 years gets a 50% discount. Relax at these private villas overlooking the paddy field while the kids scamper around in the open spaces. They have three friendly German Shepards and you are free to bring your pet along too. Food can be customized for kids and the staff is very friendly. They have a lovely pool with clean water for kids and adults to enjoy. The walk along the paddy fields, a short and easy trek to the nearby plantations and a visit to a 1000-year-old Kalabhairava temple, kayaking are some of the highlights of a stay here. The private lake offers some amazing views and a vantage point for bird watching. So carry your binoculars and camera. The have in-house board games like chess. You are free to get your own games. The property has a lot of space for kids to play. Splendidly decorated villas with lovely views, having all the modern facilities including a Jacuzzi, options to make coffee/tea in the room and a kitchenette. They even have a doctor on-call, so for parents with little kids, this is a huge blessing. Do carry along a mosquito repellant or a cream. They have 3 friendly German Shepherds and you’re free to get your pet along. You can enjoy the local cuisine that’s delicious. Customized food is made available upon request; especially with kids, this is a plus. Very warm and friendly hosts. The Ayurvedic spa here is great, we hear. So, do try it out! Get ready to be pampered by the warm hosts here who make your stay perfect and comfortable. Taste some great home cooked Malnad cusine and soak in the natural beauty. Carry your binoculars and enjoy some bird watching and trekking. The walks to the coffee plantation will leave you energized and refreshed. The homestay is located close to the Bhadra Wildlife sanctuary, and many pretty waterfalls like Manikyadhara, Kalasa and more. For animal and bird lovers, this place is a haven. Don’t let the humble settings discourage you. Although rustic, the cottages are pleasant and cozy to stay. The hospitality here is excellent. The hosts will ensure that your stay is as comfortable as possible. Enjoy home-cooked authentic Malnad food here. They even arrange a BBQ. So, foodies, take note! Wake up to the chirping of the birds in this tranquil resort at the foothills of the Brahmagiri forest. Simply take in the natural beauty engulfing you or indulge in the adventure activities to get your heart racing. Enjoy mouth-watering home-cooked food. Get to handle rare snakes with your bare hands. Sway and shake on the rope walks of the Jungle gym. Campfire fun and birdwatching, don’t forget to carry the binoculars for the kids. Streamline treks and adventure sports. 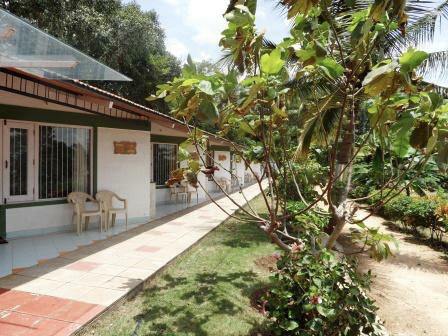 Independent cottages can comfortably accommodate a family of 4 – Rs.3000/- per night. If you’re feeling a bit adventurous you could go for their camp site tents which accommodates 2 people for Rs.2250/- per night. Please note: Only non a/c accommodation available. Kids below 7 years stay free of charge. Please note no room service is available; all meals will be served at the dinning room. Laundry service is available; a boon for parents. In the thickets of the Chikmagalur coffee plantations, stands this serene homestay that makes you feel at your ancestral home in every respect: from great hosts to lovely home-cooked meals to plenty of area for kids to play. They do have a few indoor games like cards and chess. You can enjoy a game of volleyball and badminton in the outdoors. 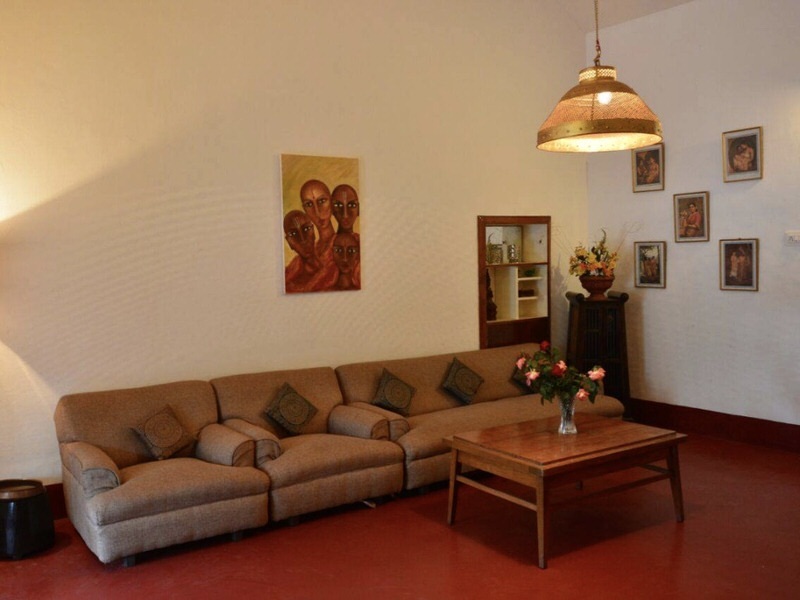 The colonial homestay is a large bungalow with 5 bedrooms and 3 baths that gives a nice rustic village retreat feel. The home stay is solar powered and the bungalow is surrounded by a large garden area with a variety of fruit trees and ample amount of open space. Cost at the homestay is Rs.2500/- per head per night. For further details on the package details click here. They also have some beautiful cottages that are located in the midst of the plantation which is ideal for a family of 4. 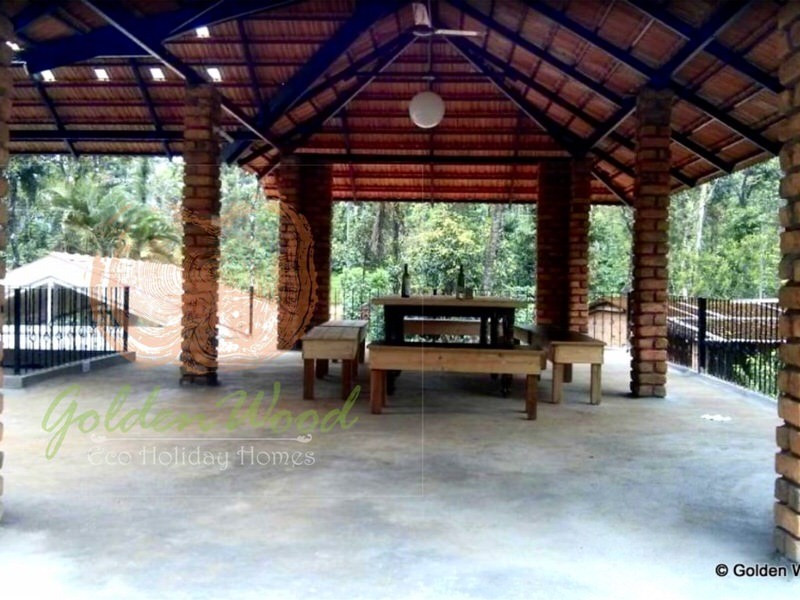 Cost for the cottages is Rs.2800/- per head per night. For further details on the package click here. Kids below 5 years stay is complimentary. * Disclaimer: BuzzingBubs would like to inform readers that these are resorts we are recommending based on ratings on TripAdvisor. We do not help with procuring accommodation at any of the resorts here nor are we personally affiliated with any of the resorts. Please reach out to the respective resorts for details on tariff, availability and other queries.